Claymagination: The Beginning of "Polymer Clay My Way"
It's time to launch into the new value-added part of Claymagination - "Polymer Clay My Way". I thought of calling it "Your PC Guru" but that sounded a bit pretentious. In this segment I present solutions to problems I've encountered, techniques I've discovered along the way, techniques pioneered by other polymer clay artists that I've tweaked to make my own, or even ways in which I've found to highlight some wonderful techniques pioneered by other artists. I'll do my best to explain the reasons behind design decisions I've made and also present you with some design challenges that I find stimulating and fun. This first episode pushes the technique taught by Lisa in last year's Claymagination 2011 retreat. One of the issues that I struggle with is settings that are not "worthy" of unique, hand-crafted art. We would all set our art into settings made from gold or platinum, if price were no issue, but in today's economy, art suffers badly, and the artist suffers along with it. We need to find a way to present our art so the work is not viewed as "cheap" yet the price we need to charge does not make our art inaccessible to most. Silver plated settings look good, but only for a certain amount of time. Eventually the plating wears off, and our art gets set aside. Precious metal is wonderful, but pricey, and to help bring down the cost, artists (such as Lisa) are now making their own sterling silver settings. I really think that is the way to go since it dignifies and elevates the work to an art, but it does increase the price of the piece. To keep the price down, if you have time available, consider using polymer settings. With attention to detail and finishing, your work becomes an even more hand-crafted work of art and it's permanence is guaranteed. It won't have to be sidelined because the plating wore off the setting! 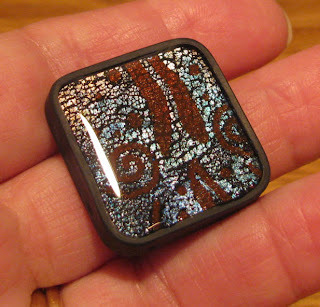 Here is Lisa's technique set into polymer clay bezels. As you can see, the lip of the bezel is raised slightly to accommodate the subsequent resin pour. 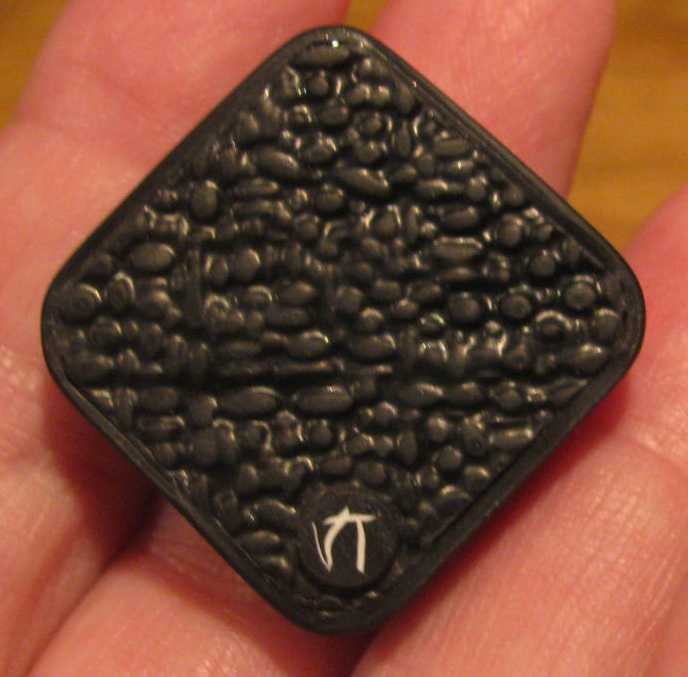 One benefit of doing this is that there is no danger of the decorated surface "floating" when the resin is poured because it sticks to the polymer clay backing. Now it's time to sand, with 400 only since I want the shine to be only on the resin surface. 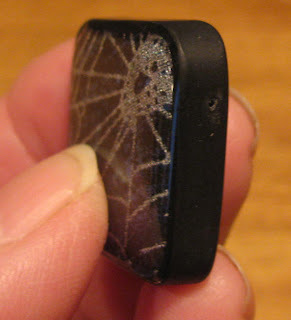 You must make sure the polymer clay bezel is firmly attached to the square as the resin will find any little crack to seep out of it if can! 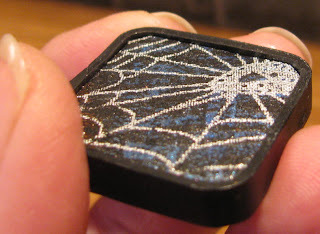 You can see the upper corner on the back in the image above, the resin started to ooze out. To see any of these pictures enlarged, just click on them. I'll post a picture of the assembled bracelet when done. If you have any questions, post them to this blog post and I'll do my best to answer them.